<b>A GENEROUS HEART:</b> Tony Johansen and Susanna Joslyn Johansen were married last Valentine's Day, with Jack London serving as best man. On February 4, my best buddy and musical companion of 25 years left us here on Earth and continued his soul’s journey to another place. Tony Johansen was a mentor to dozens, if not hundreds, of beginning musicians in the Santa Barbara area. He was voted a Local Hero two years ago. He began a jam session in his home some 30 years ago and opened the door to all in the Old Time Music world. He was a Buddhist with a skeptical twist who was exceptionally good at “keeping it real”; no nonsense went unnoticed. He took into his home those who needed a temporary place to stay, no questions asked. He had a sly smile and a generous heart. 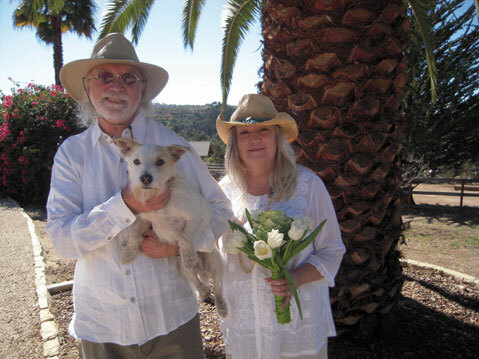 He met his beloved Susanna Joslyn Johansen a few years ago, and I was honored to officiate at their wedding last Valentine’s Day. The above photo was taken that day, with their best friend Jack London. He also served as best man. Tony had a very tough past few months, but right up to the end, he remained calm and ready for the next stop. A few days before he died, another good friend was holding his hand and telling him how much he meant to him, how he was going to miss him, and so on. Tony’s eye opened, and he said: “Don’t be so dramatic.” That’s Tony. Irreplaceable. Forgive the dramatics, Tony, but we miss you so much. Okay, okay, somebody call a tune. More than we took from it? To the great turn around? A duck pond, a small forest?